Lisa Kudrow is completely wonderful as Valerie Cherish in The Comeback. Valerie is sad and broken and self-conscious, but also shameless, and for someone you should openly loathe, Kudrow gives her some dignity and coherence. There’s a way, though, that Kudrow will always Phoebe; not that she can’t or shouldn’t play other parts, but there will always be a momentary flash of “wait! Phoebs!” when Kudrow appears. She’s just so iconic. Which is why it’s fun to think about the fact that Kudrow was almost in a different role in a major ‘90s sitcom: She was initially cast as Roz on Frasier. Peter Casey, one of Frasier’s creators and executive producers, wrote in 2006 about the casting process. 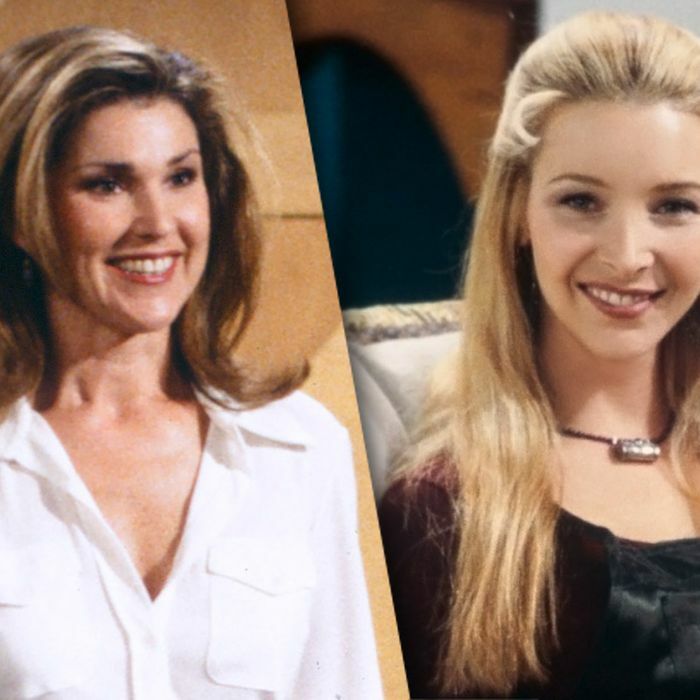 Dozens of actresses auditioned for the role, and Kudrow eventually edged out Peri Gilpin (who was eventually cast after all) after reading for NBC executives. “Lisa didn’t exactly fit the mold of what we were looking for in terms of a strong-willed character, but she was really funny,” Casey writes. “Her quirkiness made lines that weren’t intended as jokes hilarious.” But when the pilot was getting on its feet, something was off. This is how each day of the pilot production went; the cast would rehearse, the writers would come to the stage in the afternoon for a run-thru, then we’d go back to the offices to re-write and cut. By the third day of rehearsals it was becoming apparent to Jim Burrows, Kelsey, and the three of us that things weren’t going so well with Lisa as Roz. Although she remained funny in her quirky way, we found that each day we were re-writing the character less strong because Lisa just didn’t play forceful. More importantly, what Jimmy noticed was that Kelsey was pulling back in scenes with her because if he went all out like he usually did, he completely overpowered her. This was a big problem. We didn’t want the star of the show to have to compensate like that in every scene with one of the regulars, so with great regret we called Lisa and told her we were going to have to recast the part. We felt awful because she was a really, really lovely person with whom to work. And I know she was heartbroken that it had come to this, but she handled it with a lot of class. (Our consciences were assuaged the next year when she was cast in Friends). Kudrow herself spoke about it in a Vassar commencement speech in 2010. A couple of months later I was almost out of money and my agent called to tell me that Danny Jacobson, the producer of Mad About You, was offering me another small role on the show. The agent was recommending I pass on it because it was too small a role and the character didn’t even have a name. It was for the part of Waitress and I wouldn’t even see the part until I got to the set in an hour. “Don’t take it, they can’t treat you like this.” I didn’t even think twice. Of course, I took it. Whatever it is, I’ll make it funny. I’ll listen and respond and make it funny. By the second day, Danny Jacobson asked if I would be okay with being written into at least five more shows throughout the season. I told him I was ok with that. Some people thought I was funny as the waitress on Mad About You, one of them was one of their talented writers named Jeffrey Klarik. Jeffrey’s boyfriend, David Crane, who recommended I come in to read for his new show about six twenty-somethings who lived in New York and hung out at a coffee house. After many auditions, I was the second person cast in the pilot called Friends Like Us, which would later be changed to Friends. Jim Burrows also directed this pilot and the first ten episodes of Friends. One day the six of us were talking with Jimmy, exchanging The Time I Got Fired Stories and Jimmy told them mine. “Well, she’s got the worst one of all, she got fired from Frasier. ‘You weren’t right for the part darlin’.’” Thanks! And then he said, “Well, it’s a good thing you got fired or you wouldn’t have been on this show.” He was right. And it was a good thing I didn’t get Saturday Night Live and that the Romy and Michele pilot didn’t work out and every other disappointment that happened…they were like guide posts that kept me on my path. Oh and after I got fired from Frasier, I went to a birthday party and, feeling like I had nothing at all to lose, I flirted with a guy who was way out of my league. We dated and on Thursday Michel and I will have been married for 15 years. Yeah, that’s the biggest achievement of all, and we’ll be celebrating with our 12 year-old son. Thank God I got fired! Maybe there is a reason for everything. I think there is. Unfortunately, there is not actually a reason for everything, and we are all simply in a state of perpetually self-mythologizing our own experiences, but in this case, things at least seem to have worked out. Need more Friends in your life? Us, too. We’re counting down all month until the show lands on Netflix.